few kilometres from very interesting archaeological sites. For families with small children is this location not very recommended, because the access to the sea is immediately deep and rather rough. Surrounded by around 700 hectares of pine forest and directly on the 5 km long sandy beach, about 400 m from the main building, on the west-coast of Sardinia in Narbolia. The hotel distance to Oristano is 27 km, to Cagliari Airport 110 km and to Olbia Airport 187 km. Charming warmly recommend to rent a car to fully enjoy the stay at Is Arenas Resort and for discover independently the surroundings. The hotel is perfect for family and for nature lovers. The elegant interior furnishings, featuring clean lines and modern, were designed and created by the popular architect Lorenzo Bellini. The whole structure fits in perfect harmony with its surroundings and is designed to ensure the maximum respect. In total the Is Arenas Resort has 136 rooms. 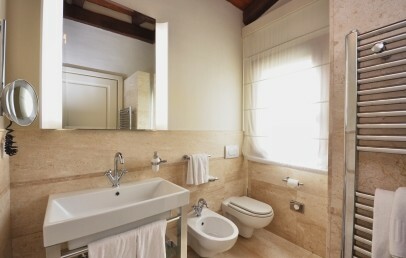 All rooms have a bathroom with tub or shower, air conditioning, Wi-Fi connection, TV, minibar, safety box. Classic – approx. 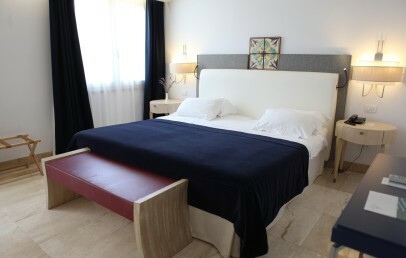 30 sq.m., furnished in a modern style with a double bed. Superior – approx. 36 sq.m., same equipment as the Classic. Possibility to add a child bed for children up to 5 years. 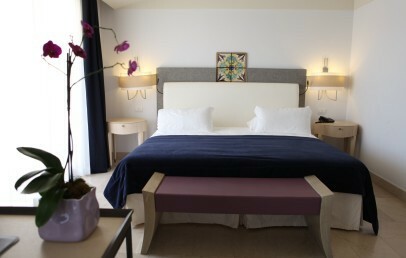 Junior Suite – approx. 43 sq.m., more spacious than the Classic rooms, additionally a small living corner with a sofa and a desk. Possibility to add a child bed for children up to 5 years. Garden – spacious rooms ideal for a family, they can host up to max. 4 people (2 adults and 2 children up to 11 years). The beach of Is Arenas is almost 5 km long and about 400 meters from the hotel away. In the surrounding there are other worth seeing beaches, like the little cove of Torre del Pozzo or the most spacious beaches of S'Archittu, Putzu Idu and Is Arutas. A Kit Comfort for the beach is included in the price and offers one beach/pool towel per person, 2 sunbeds and 1 umbrella per room. With a supplement the VIP Area can be booked and includes: Kit Comfort, bar service at the umbrella, large sunbeds for € 40 per day or € 200 per week per room. The wellness center at the Is Arenas Resort is designed to offer pleasant moments of relax, dedicated to physical and mental regeneration. It offers a sauna, a whirlpool, Turkish bath, relaxation area indoor and outdoor, a fitness room, yoga and pilates lessons, a variety of beauty and wellness treatments (to book and to pay). The Mini Club for children from 3 to 12 years is operating until 15/09, open daily from 9 am to 9.30 pm. During the evening there is a small entertainment for children. Baby Kit for € 50 per week (to book in advance) offers: baby bathtub, changing pad, bottle warmer, kettle, diaper bucket. A refined and modern restaurant which serves a delicious Mediterranean cuisine and two bars offers the Is Arenas Resort. A bar is located near in the hotel with a large outdoor terrace with patio located near the swimming pool and the other at the beach. At guests disposal is a comfortable pool and sunbathing area for those seeking a lovely alternative to the beach. Several water-sport-activities as well excursions with bike, horse or by foot or visits of archaeological sites can be arranged. Rental of electric Mountain Bike. Small pets are allowed, only in some rooms, with a supplement of € 20 per day (on request). Large and bright double bedrooms, located in the main building. The design furniture is elegant with light shades and inspired by a minimalist style. The rooms have Wi-Fi internet connection, a desk and one or two couches. The bathrooms are equipped with a tub and some rooms have also a shower. The Classic rooms overlook the pine forest that surrounds the structure. Spacious and bright double bedrooms located in the main building. The design furniture is elegant with light shades and inspired by a minimalist style. 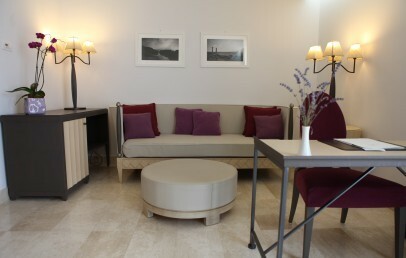 The rooms have a living corner with comfortable couch, a desk and a Wi-Fi internet connection. 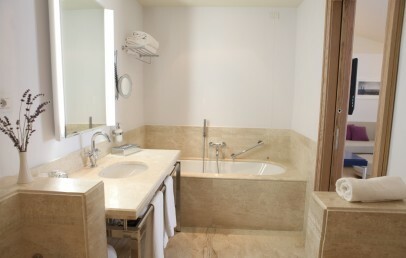 The bathroom is equipped with a tub and a separate shower, hairdryer, slippers, bathrobes and courtesy set. Possibility to add a child bed for a child up to max. 5 years. 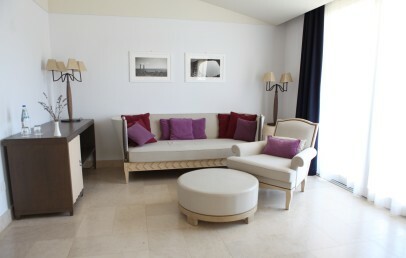 Spacious rooms with minimal décor, elegantly furnished in shades of beige and purple. They offer a double bedroom and a sitting area with a couch. The large windows overlook the lush pine forest that surrounds the hotel. The rooms have Wi-Fi internet connection, air conditioning, minibar, TV. 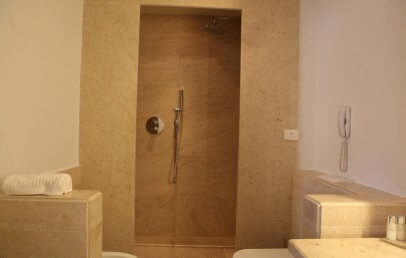 The bathroom is equipped with a tub/shower, hairdryer, slippers, bathrobes and courtesy set. Possibility to add a child bed for a child up to max. 5 years. 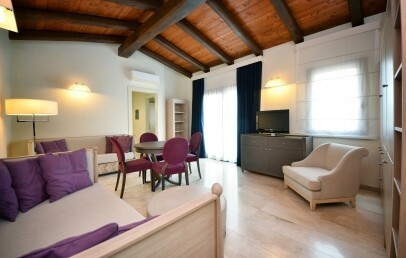 Spacious rooms ideal for families composed of 2 adults and 2 children until 11 years old. It offers a double bedroom and a separate living room with sofa bed. The rooms are bright, located in the pinewood and offer a comfortable patio with chairs and lounge table. The design furniture is elegant with light shades and inspired by a minimalist style. The rooms have Wi-Fi internet connection, air conditioning, minibar, TV. The bathroom is equipped with a shower, hairdryer, slippers, bathrobes and courtesy set. Spacious rooms ideal for families. 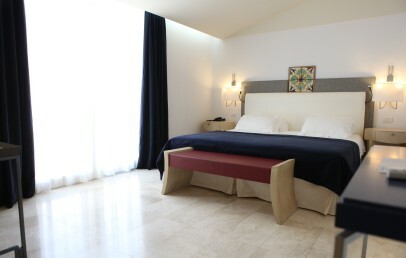 It offers a double bedroom, a smaller room with two single beds and a separate living room with sofa bed. The rooms are bright, located in the pinewood and offer a comfortable patio with chairs and lounge table. The design furniture is elegant with light shades and inspired by a minimalist style. The rooms have Wi-Fi internet connection, air conditioning, minibar, TV. The bathroom is equipped with a shower, hairdryer, slippers, bathrobes and courtesy set. The meals for the baby (0-5 y.o.) are to be paid locally, à la carte.